In recent years new development in New York City has shifted focus across the East River and onto the waterfronts of Brooklyn and Queens to bring Manhattan-style luxury to these neighbouring boroughs at affordable prices for those willing to live outside Manhattan. As a result, neighborhoods like Long Island City and Williamsburg have been transformed beyond recognition as high-rises have sprung up along the waterfront. Such development is an off-shoot of the Bloomberg administration and EDC (Economic Development Board) president Seth Pinsky who have pushed for the revitalization of the city’s development, paving the way for a strong economy in the foreseeable future. New developments in Brooklyn and Queens, however, are not seen as good news for all and are running into considerable opposition as preservation groups fear that the spread of Manhattan-style development threatens to consume the waterfront along the East River and negatively affect the outer boroughs. The latest skirmish between preservationists and developers East of Manhattan has come at the site at Greenpoint Landing, where a preservationist group called Save Greenpoint is fighting the course development is currently taking. 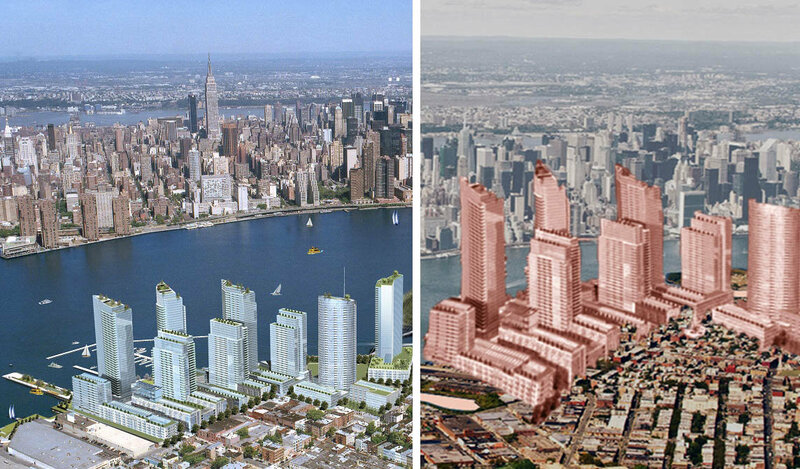 Having released its own rendering of the site’s potential future, Save Greenpoint juxtaposes the old rendering from the developer with their own, which depicts Greenpoint Landing as a monstrous cluster of skyscrapers dwarfing nearby Brooklyn and threatening to swallow it in its urban confines. While this new rendering may seem highly skewed, such a visualization of the project can have a huge impact on the site’s future. As The Times recently pointed out, the impact of renderings in guiding new development has a strong precedent in New York City and such an image can sway opinion drastically. Other projects, such as the development planned at the Domino Sugar Factory site in Williamsburg, also plan to construct high-rises along the waterfront though they have yet to be subject to significant protests. The rendering of the Domino Sugar Factory site, like Greenpoint Landing, depicts an idyllic set of modest high-rises along the Brooklyn waterfront. However, this is once more only a theoretical version of the project’s final outcome and a counter-rendering may emerge as time progresses and the project looms over Williamsburg residents. The question that potential development renderings raise is whether or not these projects will live up to their idealized renderings or if groups like Save Greenpoint are on-point with their protests against Manhattan-style luxury crossing into the outer boroughs. The full impact of Save Greenpoint’s rendering remains to be seen, but certainly declares a striking visual argument for their cause. Should the new Greenpoint Landing rendering gain traction, it could become a rallying point for preservationists along the outer boroughs’ waterfronts.